Here your first look at an extension of HEIGHTSTONIAN's new @#SelfyBus. It's a practical 13-passenger seat mobile unit to enjoy your party. 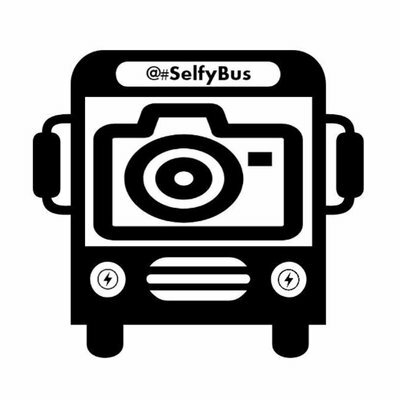 It's a mobile phone photo studio where I also host @#SelfyBus parties. It's a space of your own that rolls up anywhere buses or RVs are permitted. I only have this one unit, so you can book it anytime most anywhere. Seats 13 total. All have working seat belts. 1 booth with a larger table that will also raise and lower seats 4. The rest of the (genuine) bus seats don't have tables. Photo booth backdrops... a city-scape; disco dance floor; light blue draping. Portable blue tooth speaker with FM radio will be on board. A portable PA system with microphone for announcements is also available. No restroom on board so plan accordingly. No transports. No transfers of people whatsoever. Every location requires a new minimum booking. For more details, call Rachel at 713.591.1901.